Deb's Cup of Tea: I almost missed it. Do you see what is today? I had NO IDEA that was today. 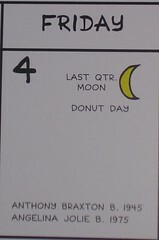 Admittedly, I did not flip my Simpsons calendar until I got home and, by then, I knew this was a very important day and was prepared to celebrate accordingly. It's not important because it's the last quarter of the moon, although I have been reminded that some planetary wonderment is afoot this week. You should be able to see Mars and Jupiter near the star Regulus, which is part of Leo the Lion. Uranus, which can only be seen with binoculars, also is close to these planets, in our view, directly behind and slightly to the right of Jupiter. Venus is the bright evening star, what you probably wish upon and then realize it's not twinkling. If you look to the southwest, you should also see Saturn. The other planets, including Pluto, are morning stars, visible within an hour of sunrise. Jupiter doesn't rise until around 2 a.m but it is visible to the naked eye at that hour. It's not important because it's Angelina Jolie's birthday. I wish her happy birthday but she's not a friend and, honestly, I don't care if she and her brood were spotted in the south of France, the south Bronx or south of the equator. It's sort of important that it's Anthony Braxton's birthday. He's a musician who has resisted the urge to categorize his music. He was influenced by John Coltrane and Paul Desmond but has also composed music with avant-garde-ist John Cage. There are some in the music world who say what he plays is not jazz at all. Indeed, Braxton himself calls it "creative music". He's released well over 100 albums including opera and free-form as well as jazz standards. That leaves the very important "Donut Day". I almost missed this. If it had not been for a post by Carole's boyfriend, David, that lead me to wonder what he was talking about, I would have blithely gone about my business today and never appropriately celebrated. 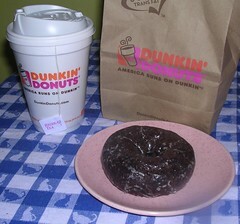 Hence, after work, I made a bee-line for Dunkin'. One medium tea and a chocolate glazed later, I am appropriately celebrating this important holiday. But there is a caveat to this. When you get your donut at 4:30 p.m., it's not the freshest in the world. Maybe I should have gotten the chocolate covered with sprinkles. Still, it was free with the purchase of hot water and a tea bag. Now, when is Chocolate Chip Cookie Day?